I am so glad to be in my own kitchen again! Now I can control what I eat. I decided to treat myself at lunch and make something a little more complex than the usual leftovers or sandwich. Using the microwave I boiled 2 ounces of spaghetti. (Yes, you can use the microwave to do this. You just need to add a couple of extra minutes to the time on the package.) 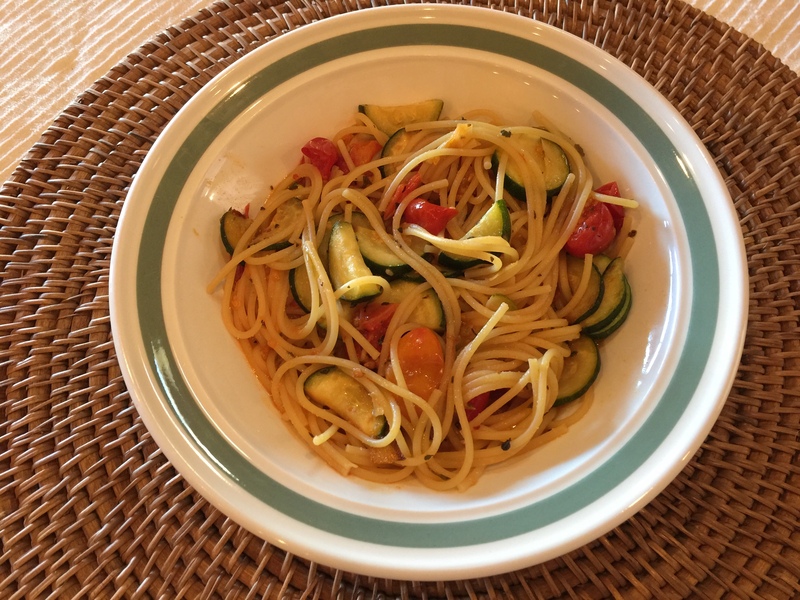 While that was perking along I sauteed a little onion, zucchini, and cherry tomatoes in some olive oil and flavored it with salt, chili flakes and oregano. I added the pasta to the sauce along with some pasta water to complete the dish. Yum, what a great lunch! For dinner we finally had the chickpea stew which was actually on our menu for Saturday night. I just was not feeling it then. So a lot of the components made the trip to Utah in the cooler and it was time to get them eaten! I got the recipe from New York Times Cooking. 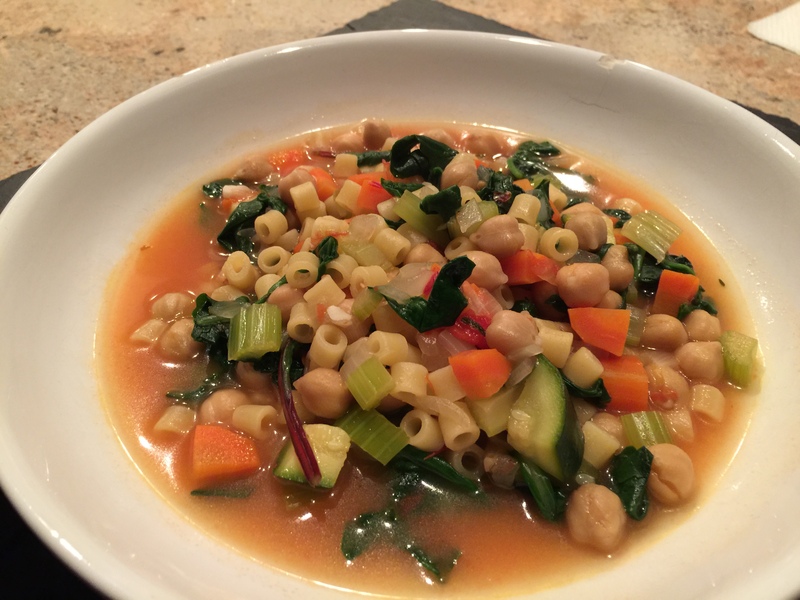 On their site it is called Chickpea Stew with Orzo and Mustard Greens. I use ditalini instead of orzo and just buy a bag of pre-washed baby kale, or spinach, whatever. This entry was posted in Kitchen tips, Legumes, Vegan, Vegetables, Vegetarian and tagged carrots, Celery, chickpeas, ditalini, kale, Onions, pasta, Vegan, Vegetables, vegetarian, zucchini. Bookmark the permalink.